Sergey Rachmaninov. Very Good. In very good packaging. 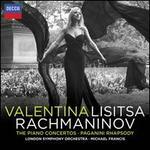 Valentina Lisitsa-Rachmaninov: The Piano Concertos / Paganini Rhapsody by Valentina Lisitsa.